Sender email address is the email address that you are using for Triggered Emails. Read full article about sender addresses and how and why sender addresses are verified here. As a part of GDPR compliancy, all Nosto Triggered Emails are sent through Amazon SES by 25th of May when GDPR is in effect. As a preparation, so that transition is seamless without any interruptions to your email delivery when Nosto migrates emails from a service provider to another, you can already verify your sender address also for Amazon SES. If you can't do this right away, don't worry this will not affect your email delivery until May 25th. Re-verification is done under Tools > Emails > Sender Addresses. In the screen-capture above, the address on top is not yet verified and is pending for verification. Click the email address which is not verified (pending verification) to proceed. 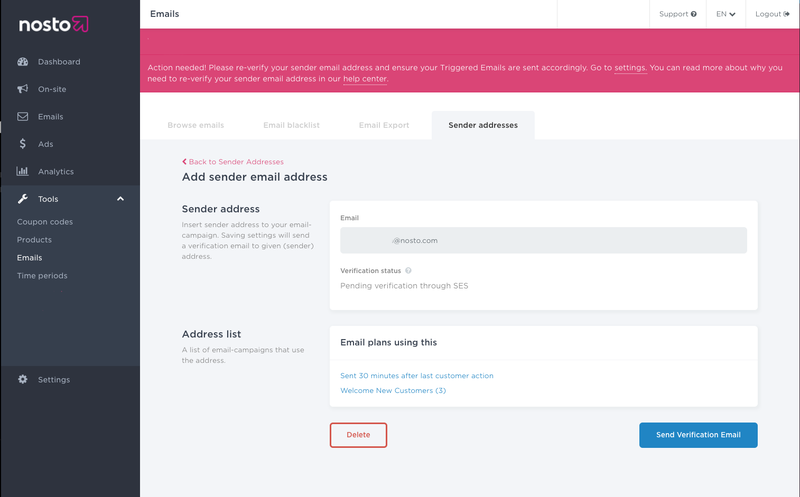 In the next view, simply click send verification email, which will dispatch the email to your sender address inbox. After you have initiated the verification process you will receive an approval email from Nosto (email: support@nosto.com) to your inbox with guidelines and manual how to finalise the verification process, basically by only clicking a verification link referring to Amazon SES. 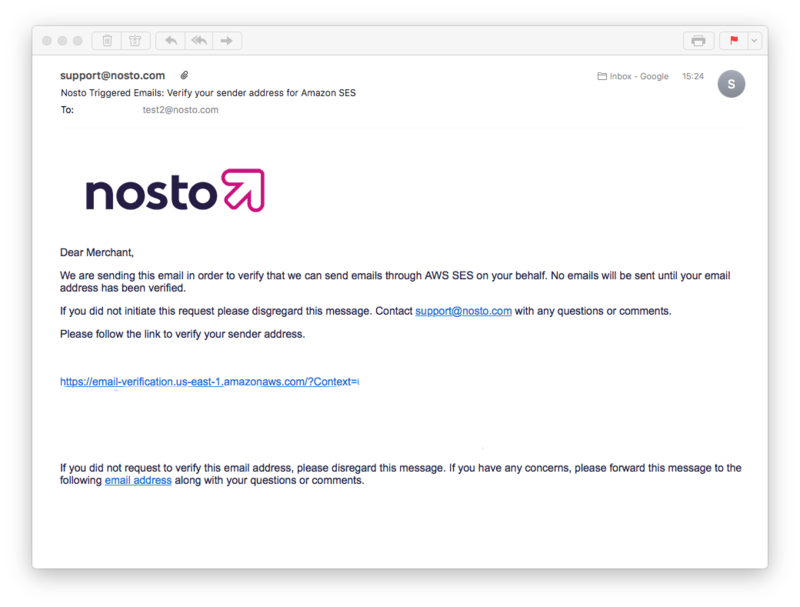 Note that the approval email is sent to the address from which Nosto sends emails, which is likely not your personal inbox. Example of an email sent to your inbox. Note that the verification link is longer than in the screen-capture above. 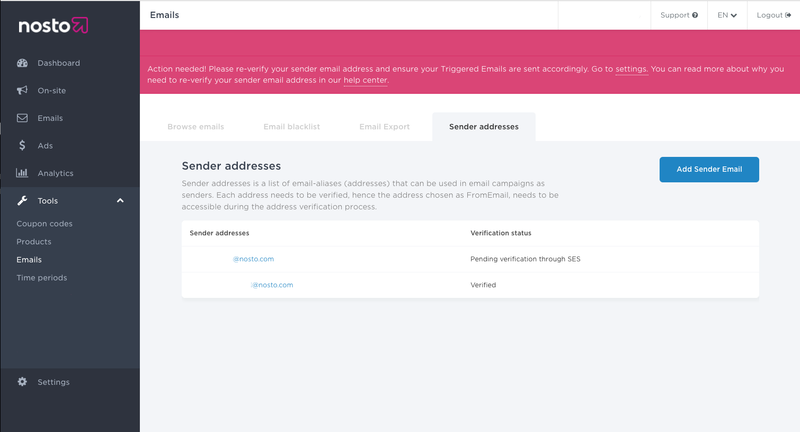 When the verification process is successfully completed, the technical migration that Nosto will do before 25th of May is done without any interruptions to your Triggered Email delivery, and all the listed addresses should have status Verified.